Kailua Canoe Club's Adrienne Wilson-Yamasaki went through the winners tunnel after her team won the women's 55 half-mile at the Waimanalo Regatta yesterday. There are 39 races in Oahu Hawaiian Canoe Racing Association regattas. At the Waimanalo Regatta yesterday at Waimanalo Beach Park, the fourth of the OHCRA season, it took until the very last one to determine a winner. With a third-place finish and two points in the last race -- 40 men's -- Kailua Canoe Club squeaked out a two-point victory over rival Lanikai 75-73. Lanikai was tied with Kailua after 38 races, but did not have a crew entered in the finale. "Back and forth," is how Kailua head coach Kawai Mahoe described it. "We just try to put our people where we can use them and where they fit. We can't adjust it too much because we're trying to qualify certain crews for (the state championships). (Lanikai is) basically doing the same thing, and we're just coming out a little bit ahead." It was the second straight win for Kailua in the AA division (18-plus crews entered) and second consecutive runner-up finish for Lanikai. The Windward-side clubs are locked in a tight battle for OHCRA supremacy that it appears could last through the remaining three regattas. In the second regatta two weeks ago, the two clubs shared the victory with the same number of points, while Lanikai took first place and Kailua second in the season opener. Once the races start, "you can't really do anything, your strategy is set," Lanikai head coach Kalani Irvine said. "Hopefully your crews perform, and you add (the points) up at the end of the day. It's a friendly rivalry, and it's interesting." As it typically does, Kailua got an early push from its youth paddlers during the first half of yesterday's regatta. Kailua's kids won six of the 13 youth races and placed second in another, leading their club to a 38-31 advantage after 16 races (novice adult paddlers also race during the first half). "We really want to see our names in the newspaper, so that encourages us," said Roclynn Nosaka, a paddler on Kailua's winning 14 girls crew. 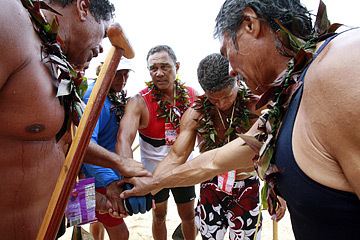 Dennis Sallas, Boy Kalama, Mel Mau, Bernie Paloma, Loka Li'i and Harold Akeo of Waimanalo Canoe Club joined hands after winning the men's 55 half-mile yesterday. Crewmember Brittanny Spencer added: "We set goals for ourselves, like beating certain crews like Lanikai." 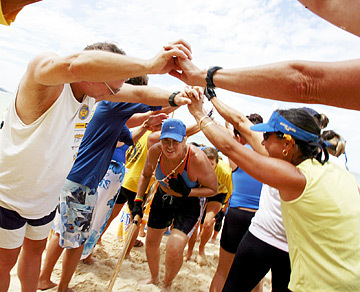 Lanikai, however, charged back during the second half, when most of the adults race are held, and even managed a one-point lead after the 36th race. But Kailua earned second- and third-place finishes in the final three races, while Lanikai got a single third. Outrigger finished third overall in AA, well back with 60 total points. Hui Lanakila won its fourth straight A Division (17 or fewer crews) title, with 56 points. As it has all season, the Honolulu club dominated the competitive open division races, even managing to sweep all four of the women's events. In the 1 1/2-mile women's senior -- the most prestigious race -- Hui Lanakila picked up its third straight win, finishing in 12 minutes, 45.59 seconds to second-place Outrigger's 12:56.59. Hui Lanakila is the defending OHCRA champion in the race. "It's teamwork," said Hui Lanakila paddler Mikala Bradley, also part of the winning sophomore crew in addition to the senior. "Being together for so long, we really trust each other, and everything feels really good right now." Bradley's senior crewmembers were Jennifer Asano, Jaimie Kinard, Seraphina Eames, Jessie Eames and Katie Slocumb. The Hui Lanakila men also took their 1 1/2-mile senior race, winning for a second straight week. The crew of Raven Aipa, Mike Silva, Chris Tseu, James Bradley, Manny Kulukulualani and Scott Hendricks finished in 11:01.98 to runner-up Lanikai's 11:17.06. Kaneohe won the AAA (25-plus crews) division by a wide margin in the Na 'Ohana O Na Hui Wa'a's Hawaiian Outrigger Canoe Club Regatta yesterday at Kailua Beach. Kaneohe scored 77 points to Na Keiki O Ka Mo'i's 49. Lokahi was third with 46. Manu O Ke Kai took the close AA (13-plus events) division with 46 points to Koa Kai's 43. The Waikiki Beach Boys captured the A division (12 and fewer crews) with 31 points. Kalihi Kai was a distant second with 12 points. AAADivision (25+ events)--1. Kaneohe, 77; 2. Na Keiki O Ka Mo'i; 3. Lokahi, 46. AA Division (13-24 events)--1. Manu O Ke Kai, 46; 2. Koa Kai, 43; 3. Alapa Hoe, 27; 4. Waikiki Yacht Club, 19; 5. Ka Mamamalahoe, 17. A Division (1-12 events)--1. Waikiki Beach Boys, 31; 2. Kalihi Kai, 12; t3. Kai Poha, North Shore, 11; 5. Hawaiian Outrigger, 10; t6. Kumulokahi Elks, I Mua, Kamehameha, 2. 12-and-under--1. Kaneohe (Richard Silva, Ezekiel Marshall, Nainoa Defiesta, Kai Leong, Makana Tilton, Jonah Awa), 2:12.56; 2. Manu O Ke Kai, 2:35.09; 3. North Shore, 2:38.85; 4. Kalihi Kai, 2:42.47. 13--1. Lokahi (Edmond "Keoki" Schuman Jr., Jame "Kaena" Gomard, Micah Lono-Holani, Chris "Ikaika" Lederer, Matthew Lono-Holani, Sidney Poore), 2:11.60; 2. Kaneohe, 2:17.50; 3. Na Keiki O Ka Mo'i, 2:18.47; 4. Hawaiian Outrigger, 2:29.58. 14--1. Kaneohe (Mana Chang, Kekoa Amby, Casey Demello, Kawela Kamakana, Lewis Char, Kala'i Lee), 2:06.51; 2. Koa Kai, 2:09.15; 3. Na Keiki O Ka Mo'i, 2:16.18; 4. Lokahi, 2:31.07. 15--1. Kaneohe (Nainoa Kahale, Ikaika Adams, Kawela Kamakana, Kaluna Kaluhiwa-Seyers, Issaac Cambra, Lopaka Cunningham), 4:10.18; 2. Ka Mamalahoe, 4:15.05; 3. Alapa Hoe, 4:21.34; 4. Manu O Ke Kai, 4:21.91. 16--1. Kaneohe (Keoni Gonsalves, Keoni Anderson, Rory Siqueira, Ben Wilhelm, Dane Kimokeo, Nainoa Kahale), 3:54.98; 2. Mau O Ke Kai, 3:57.07; 3. Alapa Hoe, 4:09.87; 4. Koa Kai, 4:11.88. 18--1. Kaneohe (Kelson Alimoot, Cory Siqueira, Mana Kipapa, Kainoa Ibarra, Keoni Anderson, Dane Kimokeo), 8:08.42; 2. Manu O Ke Kai, 8:11.46; 3. 'Alapa Hoe, 8:11.98; 4. Hawaiian Outrigger, 8:17.07. 12-and-under--1. Na Keiki O Ka Mo'i (Chelsea Aiwohi Rayno, Kylee Costa Ayres, Kristen Kamakele, Sammie-Lee Luuloa, Kryssi Padello, Brayanne Moe), 2:26.37; 2. Kaneohe, 2:36.99; 3. Kumulokahi Elks, 2:38.14; 4. Kalihi Kai, 2:41.86. 13--1. Na Keiki O Ka Mo'i (Jenna Pontes-Borje, Kylee Costa Ayres, Brayanne Moe, Kristen Kamakele, Kiana Ke, Fuschia Keliikipi-Kamakani), 2:22.65; 2. Lokahi, 2:24.10; 3. Manu O Ke Kai, 2:25.44; 4. Kaneohe, 2:26.44. 14--1. Kaneohe (Aulani Saizon, Kapua Neuman, Kree Espinda, Chelsea Hosino, Keely Gonsalves, Kahea Anderson), 2:16.10; 2. Na Keiki O Ka Mo'i, 2:27.10; 3. Alapa Hoe, 2:28.28; 4. Lokahi, 2:29.24. 15--1. Kaneohe (Teresa Rogers, Makani Kela, Brandie Kaluhiwa, Kree Espinda, Kalahiki Long, Liana Kipapa), 4:42.18; 2. Alapa Hoe, 4:47.43; 3. Na Keiki O Ka Mo'i, 4:51.54; 4. Waikiki Yacht Club, 5:00.64. 16--1. Alapa Hoe (Miyuki Tanaka, Cierra Faletoi, Jasmine Parish, Nalei Mendonca, Charlene Kahai, Tiare Lafradez), 4:30.99; 2. Koa Kai, 4:42.60; 3. Kaneohe, 4:47.37; 4. Ka Mamalahoe, 4:52.25. 18--1. Alapa Hoe (Chelsey Takahashi, Cierra Faletoi, Michelei McCabe, Nalei Mendonca, Tasha Okouchi, Charlene Kahai), 4:34.59; 2. Kaneohe, 4:44.35; 3. Kamehameha, 4:45.81; 4. Hawaiian Outrigger, 4:54.96. Novice A--1. Koa Kai (David Cadavona, Johnny Verive, Darren Kela, Rob Lund, Willie Gualdarama, Barney Beter), 7:35.23; 2. Lokahi, 7:44.02; 3. Kaneohe, 7:51.53; 4. Manu O Ke Kai, 8:09.38. Freshmen--1. Na Keiki O Ka Mo'i (Danny Sanchez, Kelii Keaweehu, Kamu Ornong, Allen Soo, Joe Kanana, Kingston Dias), 7:43.86; 2. Koa Kai, 7:44.52; 3. Manu O Ke Kai, 7:46.08; 4. Kalihi Kai, 8:42.61. Sophomore--1. Manu O Ke Kai (Charley Tantog, Jeremiah Saiz, Pete Celebre, John Hoogsteden, Derf Ibaro, Glenn Williams), 7:52.04; 2. Na Keiki O Ka Mo'i, 8:02.81; 3. Waikiki Beach Boys, 8:08.64; 4. Kaneohe, 8:17.07. Senior--1. Koa Kai (Andrew Gomes, Kelii Ross, Paul Amoy, Steve Holbrook, Brett Saguid, David Randall), 11:55.21; 2. Manu O Ke Kai, 12:10.37; 3. Waikiki Beach Boys, 12:14.75; 4. Na Keiki O Ka Mo'i, 12:16.39. Masters 40--1. Manu O Ke Kai (Elden Galiza, Henry Lopez, Mike McCue, D.J. Oga, Richard Moore, Pat Price), 7:52.43; 2. Koa Kai, 7:57.12; 3. Lokahi, 8:05.39; 4. Waikiki Yacht Club, 8:15.23. Masters 50--1. Koa Kai (Daniel Gagich, Joe Kim, Ron Ogino, Bill King, Ben Pias, James Oleole Jr.), 3:56.89; 2. Na Keiki O Ka Mo'i, 3:59.33; 3. Lokahi, 4:04.11; 4. Ka Mamalahoe, 4:12.00. Masters 55--1. Lokahi (Randy Fernandez, David Blane, Wayne Babineau, Larry Sakagawa, Robert Bevacqua, Michael Cushnie), 4:11.90; 2. Kaneohe, 4:19.49; 3. Kai Poha, 4:42.26. Masters 60--1. Kai Poha (Dennis Isa, Doug Aton, Barry Wood, Allan Gaylord, Albert Apo, Butch Ayau), 4:46.26; 2. Kalihi Kai, 5:17.40. Open 4--1. Kaneohe (Schilling Stuttgart, Aaron Abbey, Louis Figueroa, Moki Anderson), 4:12.98; 2. Waikiki Yacht Club, 4:20.54; 3. Kalihi Kai, 4:22.02; 4. Koa Kai, 4:23.02. Novice B--1. Waikiki Beach Boys (Amy Elmore, Ann Han, Karen Nordine, Jennifer Polcer, Melissa Rotella, Verena Snively), 2:06.57; 2. Lokahi, 2:17.29; 3. Manu O Ke Kai, 2:18.90; 4. Ka Mamalahoe, 2:22.61. Novice A--1. Koa Kai (Joy Ripperger, Kimberly Yamahara, Christy Lucas, Severine Busquet, Carolyn Pacheco, Lauren Okimoto), 4:31.66; 2. Waikiki Beach Boys, 4:42.26; 3. Kaneohe, 4:45.81; 4. Ka Mamalahoe, 4:57.66. Freshmen--1. Waikiki Beach Boys (Erin Offenhauser, Kelsa Teeters, Katy Grubbs, Lisa Towne, Peggy Rupe, Susan Brown), 8:38.27; 2. Lokahi, 9:00.28; 3. Na Keiki O Ka Mo'i, 9:09.34; 4. Ka Mamalahoe, 9:27.50. Sophomore--1. Lokahi (Leilani Loredo, Valerie Frank, Annette Viernes, Darlene Morikawa, Carolyn Silverio, Kathy Kuge), 8:57.20; 2. Waikiki Yacht Club, 9:49.84. Senior--1. Waikiki Beach Boys (Kelsa Teeters, Erin Offenhauser, Dana Gorecki, Andrea Messer, Cherie Lee, Susan Brown), 12:59.75; 2. Lokahi, 13:29.90; 3. North Shore, 14:06.46; 4. Manu O Ke Kai, 14:16.13. Masters 40--1. North Shore (Folly Murdock, Jane Duncan, Kimberly Walsh, Chana Dimmitt, Deidre Erickson, Donna Moore), 9:02.86; 2. Manu O Ke Kai, 9:32.77; 3. Kaneohe, 9:41.96; 4. Waikiki Yacht Club, 9:46.11. Masters 50--1. Kaneohe (Lois Lake, Tweetie Anderson, Jackie Graessle, Naomi Higuchi, Cheryl Farias, Renee Smith), 4:40.98; 2. Waikiki Yacht Club, 4:52.42; 3. North Shore, 4:58.50; 4. Ka Mamalahoe, 5:02.10. Masters 55--1. Manu O Ke Kai (Marilyn Schoenke, Sundra Ornellas, Judy Toyofuku, Donna Machado, Elaine Hornal, Lee Higgins), 5:12.00; 2. Kai Poha, 5:22.23. Masters 60--1. Na Keiki O Ka Mo'i (Julie "Marty" Marte, Gail Okimoto, Rose Angeles, Sally Wheeler, Louise Tremblay, Katie Martin), 5:27.86. Open 4--1. Lokahi (Karen Dunai, Valerie Hershey, Maile Pai, Melanie Soares), 4:51.74; 2. Kalihi Kai, 4:58.83; 3. Waikiki Yacht Club, 5:12.74; 4. Waikiki Beach Boys, 5:20.56. 12-and-under--1. Kaneohe (Brittany Boyaoa, Dayna Lau, Kiana Tilton, Makana Tilton, Kai Leong, Kasson Carter), 2:19.17; 2. Na Keiki O Ka Mo'i, 2:30.65; 3. Hawaiian Outrigger, 2:40.76; 4. Kalihi Kai, 2:51.19. Novice B--1. Koa Kai (Mike Poteet, William Goodwin, Anthony Dowdell, Marisa Navalta, Jamie Fain, Alika Horner), 2:05.35; 2. Waikiki Beach Boys, 2:05.66; 3. Kaneohe, 2:06.75; 4. Kai Poha, 2:07.90. Masters 40--1. Koa Kai (Darren Dante, Richard Rapozo, Steven Holbrook, Stephanie Reyes, Lauree Kaleikau-Gill, Tambry Young), 4:18.08; 2. Na Keiki O Ka Mo'i, 4:21.04; 3. Manu O Ke Kai, 4:22.64; 4. Lokahi, 4:29.28. Masters 45--1. Waikiki Yacht Club (John Stasack, David Wadsworth, David Banks, Patti Dupuis, Sandra Carvalho, Linda Nishimura), 4:16. Masters 55--1. Manu O Ke Kai (Randy Sanborn, Charlie Ahtoong, Joe Scallon, Elaine Hornal, Sundra Ornellas, Judy Toyofuku), 4:37.05; 2. Ka Mamalahoe, 4:38.60; 3. Na Keiki O Ka Mo'i, 4:50.70; 4. Kaneohe, 4:51.43. Masters 60--1. Hawaiian Outrigger (Carol Muller, Lillian Keaweehu, Nelly Kennedy, Samson Kaonohi, Lono Koholua, Daniel Brown), 5:01.31; 2. Lokahi, 5:10.38. Open 6--1. Waikiki Beach Boys (Andrea Messer, Dana Gorecki, Rachel Orange, Franco Arango, Takahito Iida, Chad Lee), 3:58.38; 2. 'Alapa Hoe, 4:09.82; 3. Koa Kai, 4:10.21; 4. Kaneohe, 4:10.58. 1. Kamehameha (Joshua Ho, Kayla Uyeshiro, Mariah Murdock), 2:31.59; 2. North Shore, 2:40.83; 3. Hawaiian Outrigger, 3:03.70. Division AA--1. Kailua, 75; 2. Lanikai, 73; 3. Outrigger, 60. Division A--1. Hui Lanakila, 56. 12-and-under--1. Kailua (Justin Cornair, Kainoa Singlehurst, Troy Anderson, Hopena Pokipala, Dustin Kaleo Poole, Michael Dowsett), 2:16.49; 2. Lanikai, 2:17.52; 3. Waimanalo, 2:27.92; 4. Hui Nalu, 2:28.62. 13--1. Waikiki Surf (Kalani Puaoi, Raven Pokini, Kaimi Johnson, Nikolaus Pittman, Colin Fearn, Kovan Fujimoto), 1:57.18; 2. Kailua, 1:59.17; 3. Hui Nalu, 2:05.76; 4. Leeward Kai, 2:06.48. 14--1. Kailua (Kainoa Chang, Kawai Makuakane, Kupono Kanehailua, Jackson Stogner, Kealii Paaoao, Chas Bautista), 1:49.29; 2. Lanikai, 1:53.34; 3. Outrigger, 1:54.89; 4. Keola O Ke Kai, 1:57.38. 15--1. Kailua (Alika Guilallaume, Kaonohi Malama-Custer, Taylor Ho, Talii Monma, Lawrence Soto, Ikaika Sai), 4:00.95; 2. Keahiakahoe, 4:03.73; 3. Leeward Kai, 4:08.55; 4. Hui Nalu, 4:10.43. 16--1. Lanikai (Roarke Clinton, Ryan Dolan, Conner Dowsett, Beau Moody, Jack Roney, Tim Steinmeier), 3:42.29; 2. Outrigger, 3:50.73; 3. Hui Nalu, 4:08.15; 4. Leeward Kai, 4:14.64. 18--1. Lanikai (Christopher Beuret, Antony Burris, Ruan Jones, Kirk Mueller, Eric Nelms, Haakon Smith), 7:47.78; 2. Waikiki Surf, 8:00.97; 3. Hui Nalu, 8:12.44; 4. Keahiakahoe, 8:17.66. 12-and-under--1. Kailua (Ericka Yiu, Mahina Lipp, Lahela Bishaw, Caroline Doehm, Naomi Yates, Kainoa Makua), 2:14.44; 2. Waikiki Surf, 2:18.19; 3. Lanikai, 2:28.30; 4. Outrigger, 2:28.77. 13--1. Waikiki Surf (Kailiponi McGee, Kahoku Keola, Keawaiki Perry, Leikula Gottlieb, Kalei Kina, Kehau Kelii), 2:13.05; 2. Puuloa, 2:14.47; 3. Kailua, 2:17.06; 4. Waimanalo, 2:17.43. 14--1. Kailua (Teresa Donoghue, Marian Petty-Pe'a, Tyler-Ann Carvalho-Gomes, Roclynn Nosaka, Brittany Spencer, Sarah Lockwood), 2:07.73; 2. Keahiakahoe, 2:08.22; 3. Anuenue, 2:10.34; 4. Kai Oni, 2:10.65. 15--1. Waikiki Surf (Elizabeth Leong, Poinaole Perry, Audrey Manding, Leilani Puaoi, Samantha Leong, Alyssa Tores), 4:41.07; 2. Anuenue, 4:49.40; 3. Lanikai, 4:51.27; 4. Keahiakahoe, 4:51.74. 16--1. Outrigger (Kulani Jenkins, Sara Thacker, Leigh Cullinan, Jean Cullinan, Judith Gronna, Brooke Hunter), 4:35.97; 2. Leeward Kai, 4:38.28; 3. Hui Nalu, 4:43.43; 4. Healani, 4:44.15. 18--1. Kailua (Makana Bruhn, Chelsea Meyer, Pualani Reis-Moniz, Kati Erwin, Alicia Wailehua-Hansen, Cady Uyeoka), 4:31.96; 2. Lanikai, 4:33.20; 3. Hui Nalu, 4:38.41; 4. Waikiki Surf, 4:46.74. Novice B--1. Hui Nalu (Eric Co, Harold Alcoran, Frank Ventimiglia, Charles Brown, Kyle Morioka, Ben Godsey), 3:56.88; 2. Lanikai, 4:02.88; 3. Outrigger, 4:03.76; 4. New Hope, 4:06.72. Novice A--1. Lanikai (Jasper Allbrett, Thomas Cavaco, Eckhart Diestel, Stephen Lisziwski, Patrick Shea, Sean Spillane), 7:44.62; 2. Outrigger, 7:45.57; 3. New Hope, 8:20.47; 4. Kailua, 8:21.20. Freshmen--1. Lanikai (Justin Akana, Zane Chess, Matt Crowley, Colin Garrett, Nahina Leeloy, Kalei Macomber), 7:32.32; 2. Hui Nalu, 7:42.73; 3. Hui Lanakila, 7:43.17; 4. Kailua, 7:48.72. Sophomore--1. Hui Lanakila (Raven Aipa, Manny Kulukulualani, Chris Tseu, Franz "Robby" Solmssen, Mike Hangai, Scott Hendricks), 7:16.88; 2. Lanikai, 7:26.10; 3. Leeward Kai, 7:42.07; 4. Kailua, 7:44.03. Junior--1. Hui Nalu (Todd Payes, Heith Hemmings, Timmy Twigsmith, Geordon Purdy, Matt Beal, Chris Ball), 7:36.53; 2. Outrigger, 7:49.41; 3. Healani, 7:55.75; 4. Lanikai, 8:09.45. Senior--1. Hui Lanakila (Raven Aipa, Mike Silva, Chris Tseu, James Norman Bradley, Manny Kulukulualani, Scott Hendricks), 11:01.98; 2. Lanikai, 11:17.06; 3. Hui Nalu, 11:29.75; 4. Outrigger, 11:37.73. Masters 40--1. Outrigger (Walter Guild, Billy Baldins, Bruce Black, Marc Haine, Karl Heyer, Jim Beaton), 7:39.25; 2. Hui Lanakila, 7:42.23; 3. Kailua, 8:01.13; 4. Hui Nalu, 8:26.81. Masters 50--1. Keahiakahoe (Guy Guramot, Aaron Zoller, Allan Moon, Jeff Tario, Jimmy Sequin, Tama Savusa), 3:58.39; 2. Hui Lanakila, 4:01.76; 3. Outrigger, 4:03.33; 4. New Hope, 4:07.25. Masters 55--1. Waimanalo (Dennis Sallas, Harold Akeo, Loka Lii, Bernie Paloma, Boy Kalama, Mel Mau), 3:56.66; 2. Lanikai, 4:02.29; 3. Outrigger, 4:06.53; 4. Keahiakahoe, 4:17.99. Masters 60--1. Lanikai (Fred Hemmings, Shaka Madali, George Medeiros, William Monahan, Tay Perry, William Watson), 4:08.90; 2. Hui Lanakila, 4:10.41; 3. Keahiakahoe, 4:20.86; 4. Anuenue, 4:21.33. Open 4--1. Keahiakahoe (Jace Faufata, Kamu Lau, Ikaika Rogerson, Tai Fu), 3:54.98; 2. Outrigger, 3:56.12; 3. Healani, 3:56.93; 4. Lanikai, 3:58.03. Novice B--1. Lanikai (Cynthia Blake, Tacey Burke, Penny Conklin, Kathleen McGovern-Hopkins, Hillary Radovich, Shari Samuels), 2:07.49; 2. Healani, 2:07.80; 3. Kailua, 2:09.28; 4. Outrigger, 2:14.05. Novice A--1. Kailua (Jennifer Perell, Tayter Brock, Sonya Garcia, Nikki Roy, Tamara Martinez, Kahala Titcomb), 4:22.90; 2. Hui Nalu, 4:24.25; 3. Outrigger, 4:37.47; 4. Healani, 4:40.14. Freshmen--1. Hui Lanakila (Kaipo Martinez, Kaui Martinez, Lori Nakamura, Eren Kaiyama, Leia Gella, Leahi Frias), 8:47.72; 2. Outrigger, 8:56.96; 3. Kailua, 8:57.92; 4. Lanikai, 9:03.36. Sophomore--1. Hui Lanakila (Arlene Holzman, Mikala Bradley, Michelle Arnold, Seraphina Eames, Jessie Eames, Katie Slocumb), 8:19.03; 2. Outrigger, 8:34.25; 3. Hui Nalu, 8:49.74; 4. Kailua, 9:03.89. Junior--1. Hui Lanakila (Allison Sokei, Kristi Lowry, Sara Van DcVanter, Lesline Conner, Noe Perreira, Kuumomi Ho), 8:58.26; 2. Outrigger, 9:11.83; 3. Hui Nalu, 9:23.37; 4. Healani, 9:31.26. Senior--1. Hui Lanakila (Jennifer Assano, Jaimie Kinard, Seraphina Eames, Jessie Eames, Mikala Bradley, Katie Slocumb), 12:45.59; 2. Outrigger, 12:56.59; 3. Kailua, 13:32.74; 4. Hui Nalu, 13:38.94. Masters 40--1. Hui Lanakila (Deborah Rosenblum, Gail Grabowsky, Jane McKee, Lorey Bode, Kim Martinez, Ilima Kim), 8:49.59; 2. Outrigger, 9:01.82; 3. Lanikai, 9:14.16; 4. Hui Nalu, 9:35.02. Masters 50--1. Kailua (Cathy Erwin, Donna Myeri, Vivian Griffin, Chrystal Houge, Kalei Javellana, Carleen Ornellas), 4:30.87; 2. Hui Nalu, 4:51.15; 3. Lanikai, 4:53.53; 4. Waimanalo, 4:58.34. Masters 55--1. Kailua (Sarah Jane Watson, Adrienne Wilson-Yamasaki, Shellene Gilman, Mimi Frank, Mary Martin, Nani Olds), 4:47.38; 2. Hui Nalu, 4:51.51; 3. Lanikila, 4:54.08; 4. Outrigger, 4:59.36. Masters 60--1. Kailua (Yvonne Keahi, Susie Oakland, Heather Botelho, Carole Chun, Billie Kekuewa, Susie Thain), 5:12.52; 2. Outrigger, 5:20.52 3. Lanikai, 5:25.75; 4. Anuenue, 5:30.41. Open 4--1. Outrigger (Meleana Carr, Donna Kahakui, Kendra Epstein, Melissa Mowat), 4:52.09; 2. Kailua, 4:54.51; 3. Healani, 4:58.51; 4. Hui Lanakila, 5:03.96. 12-and-under--1. Keahiakahoe (Amber Alemeida, Rachel Goings, Jonathon Mahelona, Seth Holck, Jonah Flores, Brandy Kaloi), 2:07.70; 2. Hui Lanakila, 2:10.08; 3. Leeward Kai, 2:15.42; 4. Kai Oni, 2:15.72. Open--1. Hui Lanakila (Pauahi Ioane, Lisa Martin, Vi Coito, Adam Treinen-Aea, Scott Miranda, Sean Kaawa), 3:49.38; 2. Kailua, 4:07.80; 3. New Hope, 4:11.84; 4. Anuenue, 4:12.18. Novice B--1. Waikiki Surf (Larry Ono, Joshua Davis, Ruy Nesti, Tiana Fuertes, Sharain Naylor, Haunani Bertelmann), 1:56.97; 2. Lanikai, 1:58.57; 3. Anuenue, 1:59.06; 4. Kailua, 2:00.88. Masters 40--1. Hui Nalu (Kurt Kottrell, Bruce Blankenfeld, Earle Chang, Erin Noordhoff, Brigitta Costerholt, Denise, Darval-Chang), 4:02.15; 2. Healani, 4:11.90; 3. Lanikai, 4:12.72; 4. Outrigger, 4:17.41. Masters 55--1. Hui Nalu (Jane Kirton, Bill Welch, Michael Walch, Diane Warncke, Diane O'Reiley, Bernie Kilonsky), 4:37.48; 2. Anuenue, 4:40.99; 3. Lanikai, 4:41.63; 4. Kailua, 4:41.88. 1. Leeward Kai, 1:59.65; 2. Healani, 2:06.04; 3. Kai Oni, 2:06.11; 4. Kailua, 2:06.35.